Keeping the exterior of your home looking good can be quite a big job. 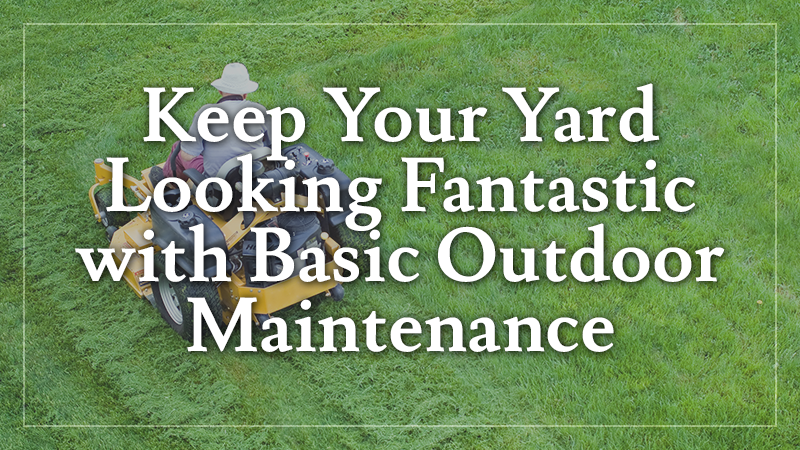 After all, you have to consider lawn care, gutter cleaning, tree trimming and more. If you’re just starting out as a homeowner or just want to learn more about home maintenance, we’ve got some tips and tricks of the trade that will help you complete these projects at the right time of year and as quickly as possible. That way, you can get on to the real business of enjoying your property and home! There are few people who would openly admit to enjoying the task of cleaning their gutters. Anytime you’re balanced precariously on a ladder, 6-15 feet in the air and leaning out with clumps of dead leaves and heaven-knows-what raining down on you, well, that’s probably not the recipe for a fun (or safe) day! However, cleaning your gutters is an important part of home maintenance and will keep your home dry inside and prevent rot around the trim and siding. Extension poles, shop vacuums and even robots can assist, but if getting on a ladder in the air makes you nervous twice a year, it’s time to call in the professionals. Doing it yourself is great, but be sure you have safety goggles, a dust mask and something to scoop out the gutters. It’s always essential to have a spotter as well to keep your ladder stable. The best way to clean out gutters safely is to use an extension on a leaf blower so that you’ve two feet planted safely on the ground while still getting debris out of the gutters. Many people admire the beauty and stately elegance of large, well-formed trees, but aren’t sure how to get their gangly trees whipped into shape. The answer is simple—keep them pruned. Pruning the trees in your yard is a part of lawn care that can help keep your home safe from hazardous branches. It also allows you to remove any diseased limbs and actually help the tree grow, as those limbs could be sucking nutrients away from the roots. Mowing your lawn once a week in the summer isn’t quite enough to create a gorgeous, emerald green lawn. The main things your grass needs to grow successfully are sun, rain and fertilizer. You can help ensure that your lawn has a carefree existence when you get rid of additional weeds and keep the soil soft and ready for growth. Testing soil pH can provide valuable knowledge into what type of fertilizer will be most effective, and loosening the soil allows an easy foothold for new grass seedlings. Whether you seed the land yourself or get some assistance, adding some additional grass can help keep weeds out while making your lawn look amazing. When you water your lawn, don’t make the mistake of lightly sprinkling it with water every day. Instead, water once a week and water it deep. This allows the roots to get the full amount of water that they need and keeps them from becoming too shallow. When you need an extra hand around the house, keep L&L Contractors in mind! We are your No. 1 source for home maintenance when it comes to roofing, decks, siding, windows and more. Schedule your free, no-obligation consultation today!